CLEVELAND, Ohio - If or when - pick your conjunction - the Browns win a game, there's going to be free beer for fans. Bud Light, never adverse to sports marketing or promotions, has come up with a fun one: Special locked refrigerators, filled with Bud Light, will be triggered via smart technology and opened the second the Browns have notched their first regular-season victory. If you're near one, well, cheers. "We're always cheering for them," said Andy Goeler, vice president of marketing for Bud Light, an NFL sponsor. "Obviously they haven't won in a while. We're putting victory fridges out into the marketplace. When the Cleveland Browns win, at the end of the game, these refrigerators ... will send a wireless signal that will unlock them and give fans the opportunity to have a celebratory Bud Light." Several of about 10 Bud Light Browns 'Victory Fridges' approximately 8 feet tall - "they're not small dorm sizes, they are full size," Goeler said - will be put inside FirstEnergy Stadium. The remainder will be positioned around the city and in suburban areas, in places where patrons need to be 21 or older. The fridges will open regardless of whether the victory is at home or on the road. Each orange and blue fridge holds upwards of 200 aluminum 16-ounce bottles. The company is being a bit coy about specific locations because Ohio law prevents pre-promotion of this type, the folks at the beer company say, but all will be in the "general Cleveland area." "It got more interesting as we started to talk about the smart technology," Goeler said. "It was a cool idea to send out a wireless signal - they win, people who are lucky enough to be around can celebrate." For those wondering if this violates the league policy of cutting off beer sales at the end of the third quarter, it does not, since the bottles are not for sale. A Bud Light rep says "It's up to them (Browns) to distribute them at their discretion." 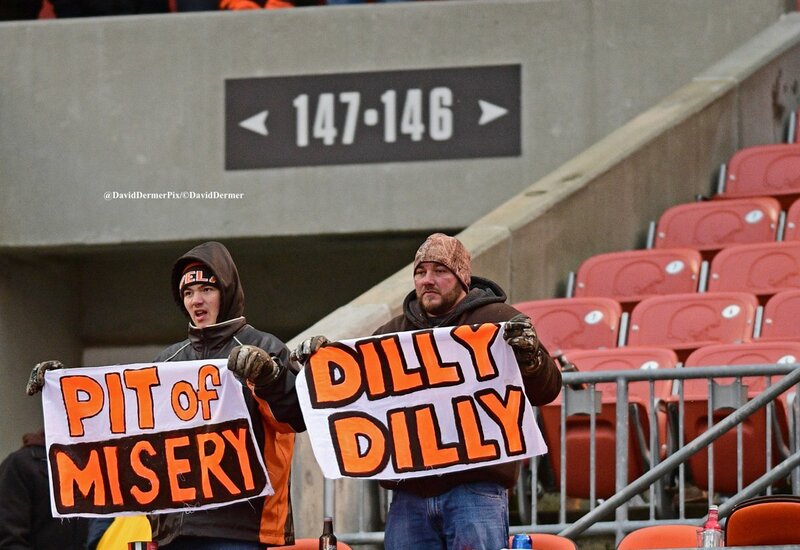 The idea was born when Bud Light execs spotted Browns fans holding "Dilly Dilly" signs last season.